Sometimes, it only takes a small act to make things feel different. 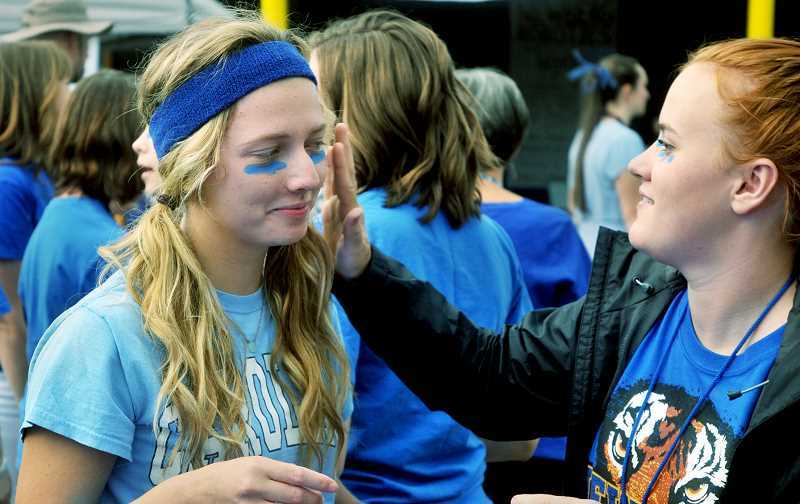 For Newberg High School math teacher Angela Stutzman, it's been receiving a weekly email from assistant principal and athletic director Tim Burke sharing the positive comments he heard about staff during the week. "It's just a different vibe this year," Stutzman said. "I don't know if I could put a nail on exactly what it is, but I think a lot of things have happened." Not being able to attribute the strong start to the year to one big change or decision seems to be exactly the point, as there have been so many relatively small efforts that together have brightened spirits and revived optimism across the district. "To have a real culture shift, we're going to have to have a lot of people doing small things that are going to collectively add up," parent volunteer Emily Chlumak said. "There is no one big solution that's going to push the culture in the right direction." Chlumak likes to point to district director of strategic partnerships Luke Neff's ongoing makeover of the NHS library into a modern media center as a great example because he's taken an inclusive approach to recruiting help and keeping parents and community members informed with effective communication on social media. She also praised NHS activities director Mark Brown for using creative ways to make parents feel welcome as volunteers in the school. She knows it's a difficult task considering all of the red tape and procedures that are in place to keep students and staff safe. "I think the words have been out there a long time," Chlumak said. "Schools knowing how to actually make parents feel welcome versus saying they're welcome, there's a leap we need to make for that. I think they're trying to test actions that actually make parents feel that way and just communicate more, but also take opportunities when parents are offering to contribute and push themselves a little further to be open and work with them more." When the district took public input during the budget process, there was a common refrain that parents would be called upon to help out more and support a reduced staff dealing with larger classes. It appears there has been significant follow through on that front, beginning in the summer, when many parents spearheaded small projects at their schools. One of the most visible examples was the renovation of the bathrooms in the main hallway at NHS, which have been a consistent source of complaints from students for years. "They were very institutional, they were sterile, they were dirty," Erion said. "Those bathrooms are amazing now. It feels welcoming. It feels warm. It's a place kids want to take care of because it feels so good." 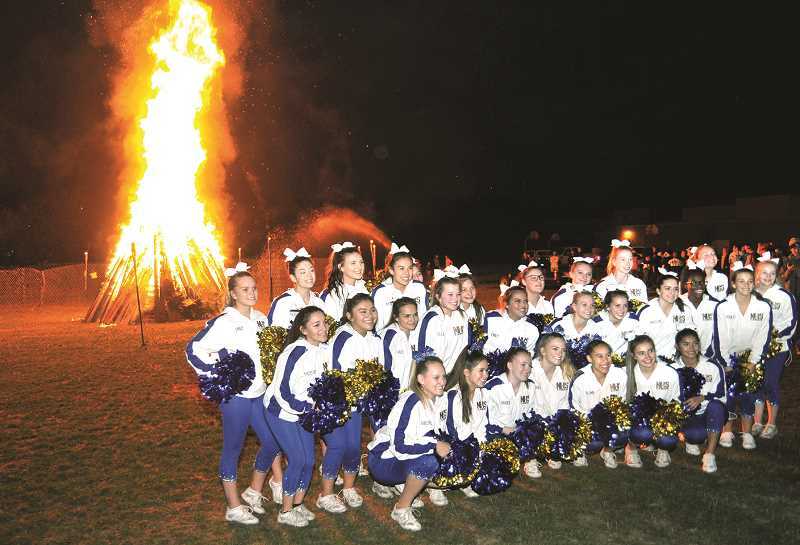 The Newberg Boosters have also stepped up their efforts to provide more activities to engage families and students, the most recent example being a bonfire Oct. 3 following a home cross-country meet. By most accounts, staff morale was low last year, but appears to have bounced back so far for similarly wide variety of reasons. One is that district leaders and principals responded to staff feedback to scale back district-level initiatives and have instead prioritized providing better support. For example, Mountain View Middle School principal Terry McElligott said that ramping up to a 1-to-1 ratio of digital devices to students last year proved to be overwhelming in her building in terms of managing the transition to students having them all the time. This year, they have been made available in classrooms only and if a student needs to, they can check one out overnight. "'All means All' (one of the district's initiatives) is still there because we have to teach every kid, but we kind of talked about making it a culture of learning and a culture of caring for all," McElligott said. "Buildings are at different places for sure, but everyone can understand that you if treat every kid like they can learn and you care for every kid in a way that they need to be cared for, you're going to go far. You don't have to have everything going on." According to Mountain View teacher and district veteran Judy Brown, at least some of the credit for the people-first approach should go to interim superintendent Joe Morelock. In addition to meeting with him personally, Brown said that Morelock made a great impression at an all-staff meeting to kick off the year. "He just wanted to make sure that we knew there was hope because we've chosen to stay in this community and push through all the tough stuff," Brown said. "If people value people, and Dr. Joe says that, and staff are feeling that, then we're going to do a great job." The hope is that a better supported staff will be empowered to better engage with students and the positivity will affect students in that way, too. "When you're married, they say, 'Happy wife, happy life,'" Stutzman said. "If you're staff is happy, then you're students are going to be happy, too." Although teenagers will still be teenagers and progress can't be expected to hit all students at all schools like a wave, early reports from students are encouraging. "I've been talking to a lot of people around the school and I'm very happy to report that a lot of kids this year feel quite cheerful and optimistic about their classes and how the school year is going to turn out," student representative Owen TenBrook told the school board. "I believe the overall morale of these students this year is higher this year and hope it will continue on throughout the year." Brown added that while morale is up, staff and students won't be won over completely in a month or two, so the efforts will have to be ongoing and sustainable in order to really affect lasting change. "I think it's better, but it's early," Brown said. "It can't just be a September thing. It has to follow through each month."